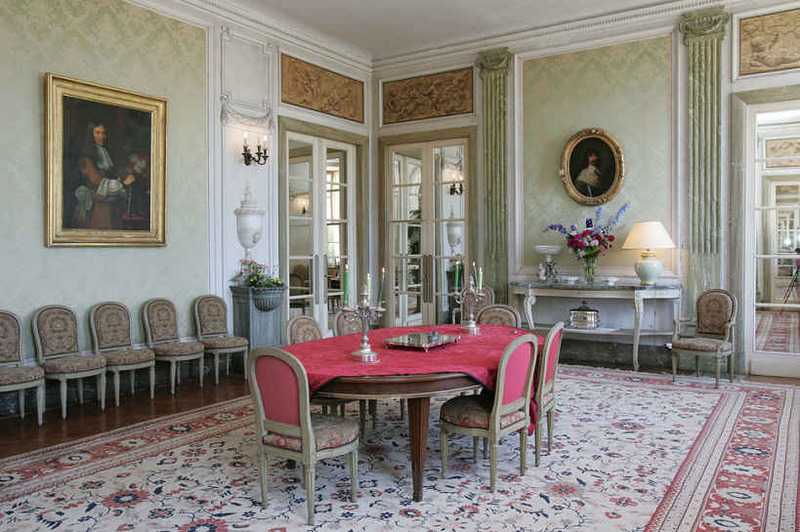 The Château de Craon offers you sumptuous bed and breakfast rooms, including the Baldaquin Suite for vacation rentals in France. Entering your room you will be taking a journey back in time. 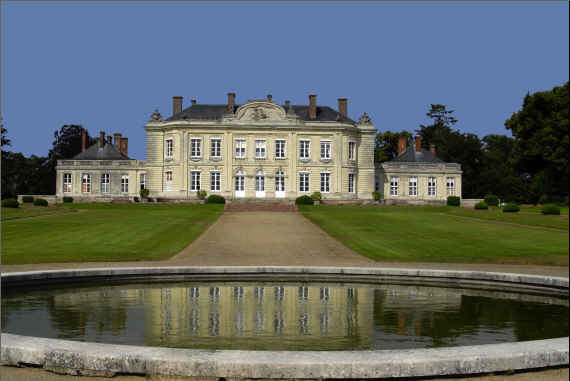 The Château is just two hours and two centuries from Paris. Comte et Comtesse Loïk de Guébriants' hospitality will make you feel at home, while you are being treated as an honorary guest. 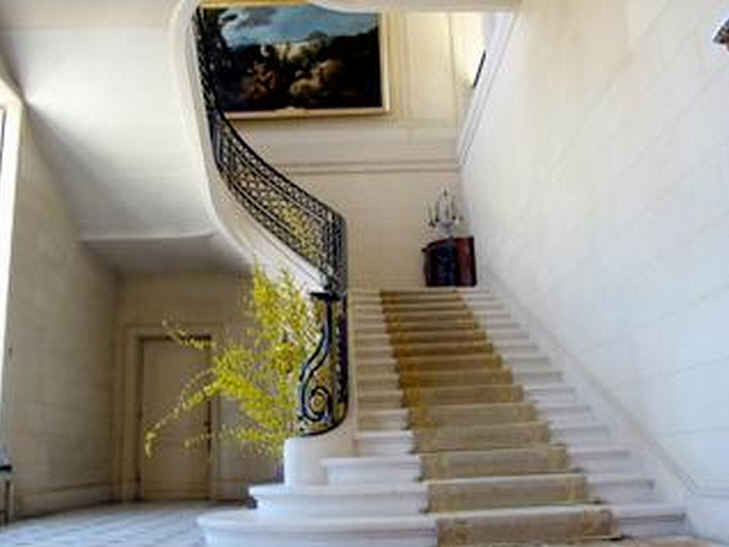 The Château de Craon is ideally located for visiting the Loire Valley and its famous castles. 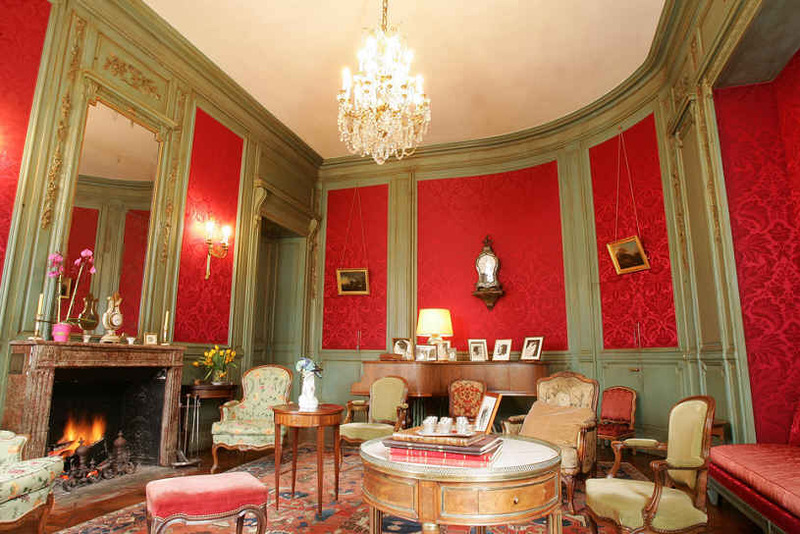 The apartment is in the east wing of Craon castle with 3 double rooms, one room with 2 single beds, one single room. There are two bathrooms with one shower and 2 toilets upstairs. 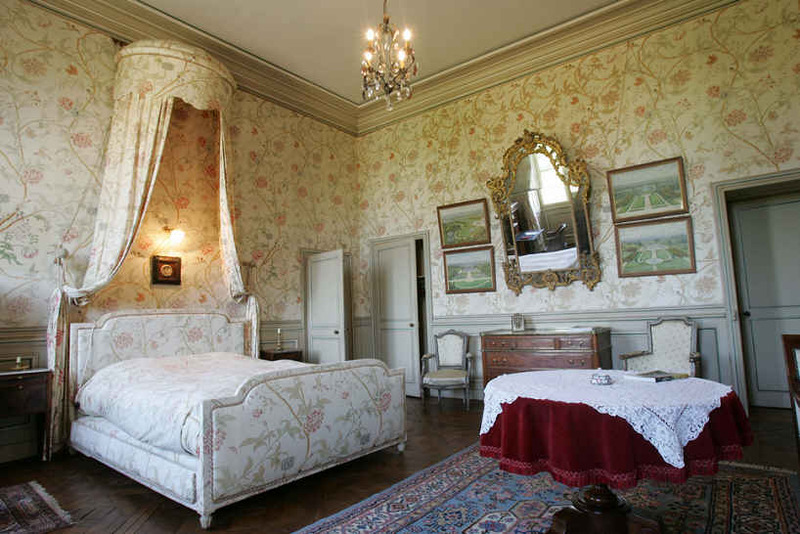 The Château de Craon offers you eight beautiful bed and breakfast rooms, including the Baldaquin Suite. Suite Baldaquin at Château de Craon : The Suite Baldaquin is perfect for a honeymoon couple. Tastefully furnished with Louis xvi furniture, parquet floor and rugs, it has a king-sized bed and ensuite bath, shower and toilet. Study carefully the four watercolors done by the landscape artist Redon in the 1930s and then contemplate the existing garden from one of the large windows. The castle gardens of today respect very closely the original plans. You will feel like the count and countess of the castle in this spacious, impeccable suite. The Suite can accommodate up to 4 people in the two double beds. La Chambre Ovale You will be simply enchanted by the spacious Chambre Oval. This room is done in blue tones, has a parquet floor, rugs and period furniture. There is an ensuite bathroom with sink and toilet. Absolutely unique is the private elevator to the modern marble bathroom with bathtub half a floor below. The previous owner put in the private elevator for this room in 1935. It has since been redecorated and this room includes a beautiful Dutch chest. 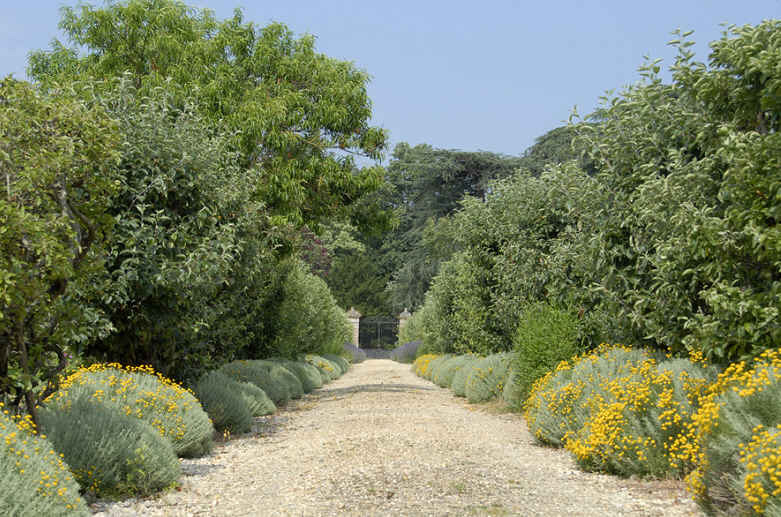 The view of the garden and 5 large lime trees (tilleuls) that were planted in the 18th century is exceptional. 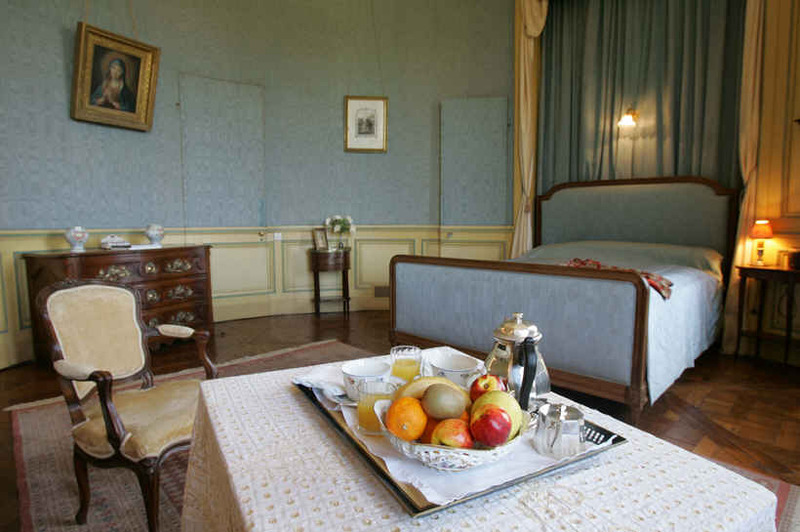 La Chambre Perruches : This pretty room is situated on the east side of the castle. The wallpapering is very colorful and the bed in an alcove makes this a cozy and intimate room. A map of the castle's French garden on the wall is lovely to study and compare with the existing garden. La Chambre Perruches communiques with La Chambre Empire and can be booked as a suite for two or three people or booked solely for two. There is a private bathroom and toilet. La Chambre Bleue : The spacious Blue Room is in the central part of the castle overlooking the lovely French-style gardens. There are two large single beds, antique furnishings and paintings, a parquet floor with oriental rugs and a marble fireplace in this room. Imagine yourself writing postcards at the Louis xvi desk after revising your French history of all the kings of France that are displayed in the corridor just outside your room. There is a modern ensuite bathroom with bathtub, sink and toilet. La Chambre Empire : This lovely room has a private bathroom with shower and wc. La Chambre Agnes : This room is simply charming. The bed in the alcove goes perfectly with the furnishings. Originally this was one of the family children's room at the castle and today it is for our guests. There is a private bathroom with bathtub. Children's Room at the Château de Craon : This charming children's room communicates with the La Chambre Bleue or the Baldaquin Suite and has two single beds and a sink. Your children will be delighted with their own room in the castle. You will want to relax and just enjoy the castle and grounds during your stay at Craon Castle in France. 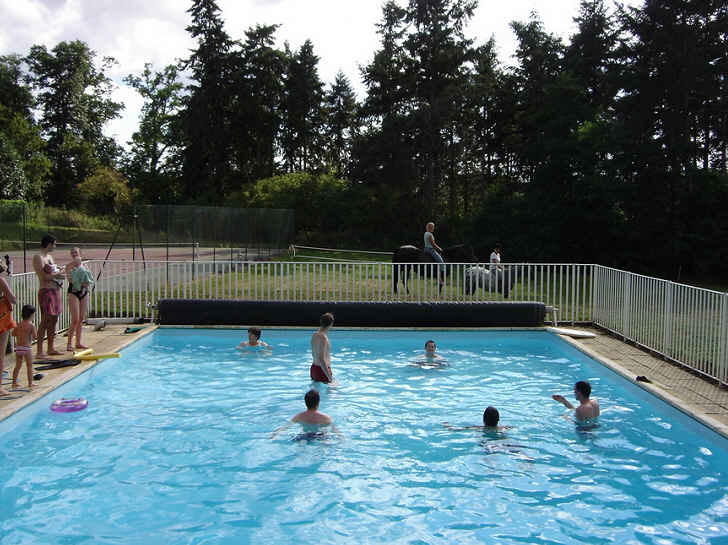 Yet it is also a perfect location to explore the Loire Valley with its famous castles, gardens and historical sites on half- or full-day excursions returning to your 'own' castle each night.